United dominate but a late equaliser sees Ross County grab a 1-1 draw to all but wrap up the Championship title. United went into this game knowing that anything less than a win would be a blow to their Championship title ambitions. Queen of the South’s surprising 2-1 win at Tannadice on Saturday had now left the Tangerines 5 points behind Ross County, who also had the extra advantage of a game in hand. 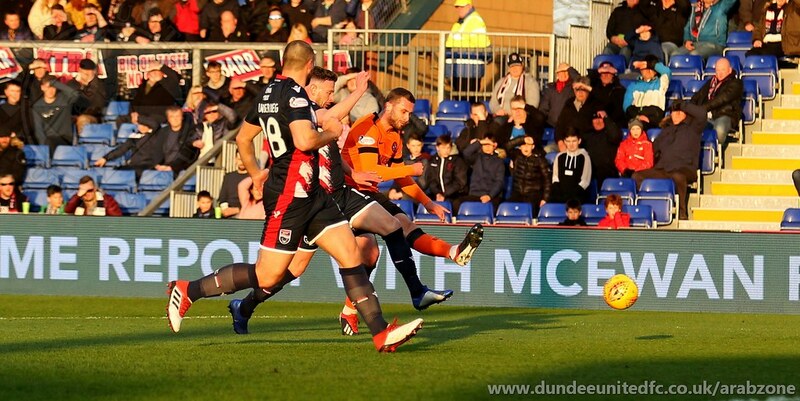 The Staggies may have also dropped 3 points last Saturday, against Alloa, but they made up for it with an impressive 2-1 win in the Highland derby against Inverness on Tuesday night. United Manager Robbie Neilson made 4 changes to his starting line up from last Saturday’s side. Watson and Connolly return to the side after missing out completely at the weekend, whilst Harkes and Pawlett step up from the bench. Booth, Stanton and Bouhenna drop out altogether whilst Seaman drops to the subs' bench. The home side made just one change from their Highland derby victory. Draper drops out of the squad altogether with Spence taking his place in the starting line-up. Ex-United player Gardyne makes up the numbers on the substitutes' bench. First Half - United started with McMullan playing up top and Clarke playing off him; Safranko and Pawlett playing left and right respectively behind them. A positive set up from Robbie Neilson and clearly shows United’s intent in this must win encounter. United started brightly and were unlucky in the 5th minute when a series of passes and crosses around the County box couldn’t find a way through. Harkes and McMullan in particular looked to create a breakthrough. In the 9th minute County’s Armstrong was unlucky when his mazy run down the left found him cutting inside the box. His cross come shot was well saved by Siegrist down low to his left hand side. United’s pressurising paid dividends in the 12th minute when a slack pass from Boyle was cut out by Harkes. The American’s quick one two with McMullan finally found a neat pass to Safranko. The striker raced into the box and his drive flew past Fox in the County goal for his 12th of the season. 1-0 to United and the travelling Arabs were singing the Slovak’s name from the rafters. The early goal sparked County into life and Armstrong continued to cause problems down the United right. Despite County’s pressure, United were zipping the ball around well and their attacking set up was clearly working. In the 22nd minute United were unlucky not to add a second. Clark’s pass to Pawlett led to a whipped cross into a packed box which was deflected off a County player for a corner. A deflection that could easily have given United a valuable second. McMullan’s pace and movement was proving invaluable and giving the league leaders cause for concern at every opportunity. The winger showed just why he was rewarded for his display’s this season by signing a contract extension this week. United continued to have the upper hand but were largely confined to the midfield area. Plenty of personal battles being played out all over the pitch but no real concrete chances from either side. United’s defence was resolute and showed why they have lost the fewest number of goals away from home in the league. Connolly and Reynolds continued to improve their defensive partnership, and with the latter signing a 3 year contract from Aberdeen after his loan spell finishes in the summer, the future looks brighter for United’s rearguard. In the 43rd minute United were unlucky again when another mistake from Boyle was intervened by McMullan. The winger’s unselfish pass to Clarke was well struck by the striker but was saved by Fox in the Staggies' goal. The first half came to a close with United maintaining their slender lead. Manager Robbie Neilson will have been delighted with his sides performance so far, but will have been ruing their missed chances. Second Half - No changes from either side at the beginning of the second half as County kicked off. United kept the same positive shape and were continuing to see plenty of the ball up front. Like the first half, United were the better side, but couldn’t find a way through. The middle third of the pitch was seeing all the action and United’s Butcher and Harkes were putting in a hard shift. On the hour mark, McMullan did find some space just outside the box but his shot was always rising over the bar. County were playing the long ball now in the hope of catching United out. The home side made the last of their 3 substitutions by the 68th minute and the management duo of Ferguson and Kettlewell were clearly looking at throwing everything at United in order to get back into the game. A poor shot from Lindsay which deflected of Cowie out for a goal kick all that County had to show for their efforts by the 75th minute. United were now playing safe and a change in personnel saw Fyvie coming on for Clark to shore up the midfield. Despite this defensive change, it was United who created the next opportunity. A run from McMullan down the right saw the tricky winger’s shot come crashing off the left hand post. Replays would show that Fox did get a fingertip save on the ball to keep United from killing the game off. The travelling Arabs had their hearts in their mouths when a Connolly header in the 85th minute back to Siegrist was intercepted by Graham. The ball then fell to Mullin whose quick shot was just past the United left hand post, with Siegrist left in no man’s land. As the Fourth Official indicated 6 minutes of injury time, it was clear to the travelling fans that, as usual, United were going to make them sweat. In the 94th minute the game, and possibly the title, took a huge twist. County’s Gardyne crossed from the left and Spence’s shot was initially parried by Siegrist, only to fall to Lindsay who lashed the ball into the United net. This was to prove to be the last opportunity of the game as referee Steven McLean blew for full-time at 1-1 just 60 seconds later. A point a piece but little reward for United’s efforts over the course of the game. Ross County must now be favourites to wrap up the Championship title as early as next week. United head back to Tannadice for next Friday’s game against Ayr United looking to cement a second place play-off spot after tonight’s game. Man of the Match - Paul McMullan. One of his best games in a United shirt. Caused Ross County no end of problems with his running and creativity.